Our indoor entertainment with Little Dude has mostly been soft play until now, but he's now interested in rides and games too. 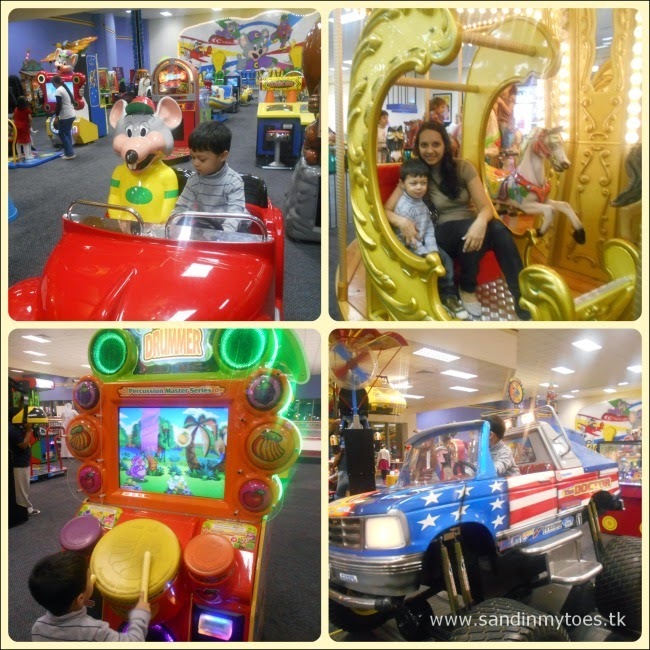 So, an invite to visit Chuck E. Cheese's at Dubai Outlet Mall seemed like a good idea to try something new! 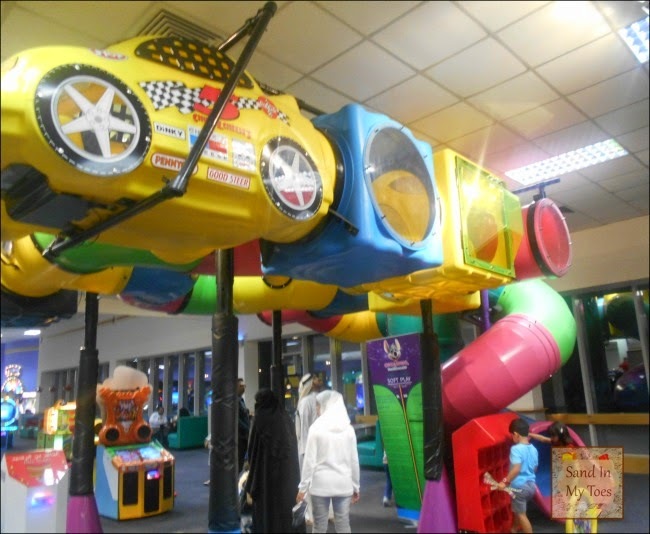 You can get to Dubai Outlet Mall on the Dubai-Al Ain road on Route 66, and you'll find an entry to Chuck E. Cheese's directly from the outdoor parking. The place is brightly lit and huge - 50,000 sq ft huge! It has over 200 games for all ages, but the good thing is that there's lots of open space for kids to run around, and many seating areas for families to sit. 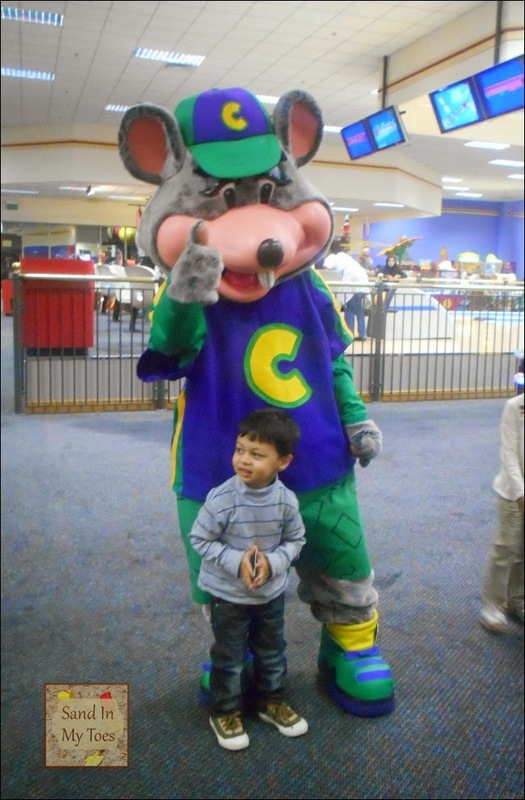 We were lucky to have met Chuck E. himself soon after entering! As you would expect, Little Dude was really distracted at the moment. Once you enter, pick up a coupon from the restaurant just at the entrance, and you will get a token card. Swipe these at the games and rides, which display how many tokens are required to play. There were so many games to try, we couldn't decide where to start at first. 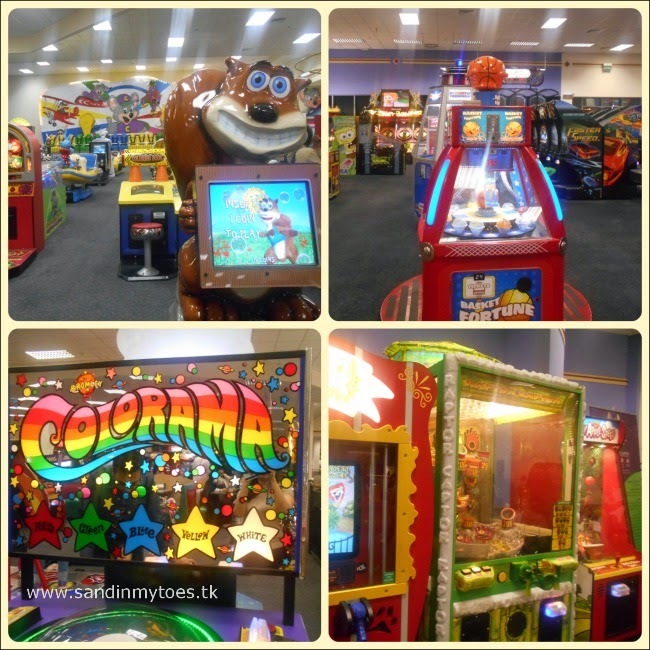 Chuck E. Cheese's has something for toddlers to older kids, and even adults. The children there were all having a good time, but I'm sure I wouldn't have been able to work out how half these games worked! We tried most of the games in the Toddler Area, and of course, Little Dude's favourite was the Monster Truck ride which he went on several times. I joined him on the Merry-Go-Round because he wouldn't ride it on his own, it being his first time! There are loads of arcade games too, which are great for game lovers. Dad and Little Dude tried a few of them. One of the main attractions for Little Dude was this play tunnel, which I was a little wary of letting him go into because it seemed like a maze! But he surprised us by going in it many times over, and popping at different windows to surprise us. This one is free to play for young children. After all this playing, naturally it was time for a refueling! Chuck E. Cheese's are known for their pizzas, so we ordered a medium one (which has eight slices, and is also the smallest one) and a Grilled Chicken sandwich. For Little Dude, we ordered a Chuck E. Kids Meal with the chicken sandwich. We also tried the fresh salad bar which had lots of healthy ingredients. The pizzas start from AED 36, and the kids meal is AED 20. The pizza base was soft, and it certainly tasted fresh. Little Dude didn't complete his meal but was full enough to go back to play. 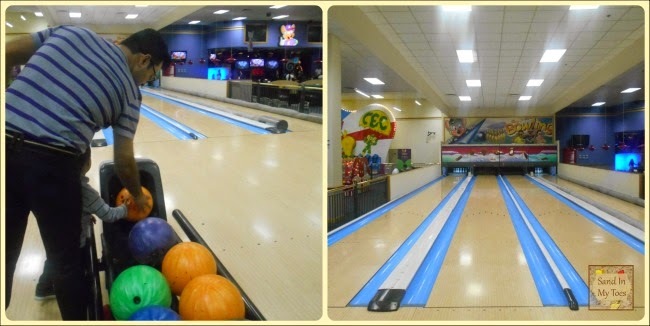 Chuck E. Cheese's also has a family-sized bowling alley, so kids can play too. Dad had fun bowling, while Little Dude wasn't happy about not being allowed to pick up the bowling ball! But he did enjoy watching the game. They also have a small ice rink, where assistants are available to help children skate. We didn't try that because the little guy wasn't too keen. 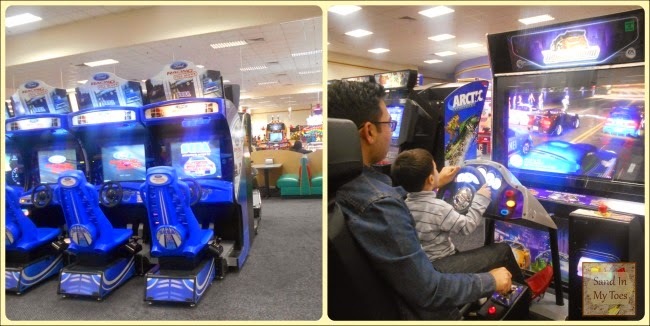 Chuck E. Cheese's tagline is Where A Kid, Can Be A Kid, but I think it also applies to adults who are kids at heart! If you are looking for indoor entertainment for the whole family, this is a great option to try. There's enough to keep you busy for quite some time! 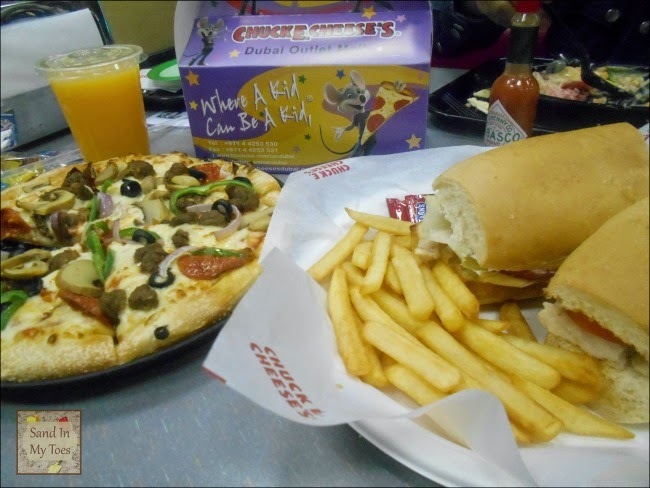 Chuck E. Cheese's has a special offer on Sundays and Mondays, where you get an AED 20 bonus on a token card of AED 100. Check their website for more details and offers. They open from 10 am to 12 am on Thursday and Friday, and up to 10 pm on the rest of the days. You can also celebrate birthday parties at Chuck E. Cheese's. They have an open party area called Studio C and three party rooms, Packages start from AED 60 per child, and go up to AED 140. They also have other party activities available on request. Contact them on 04-4253530 for bookings. 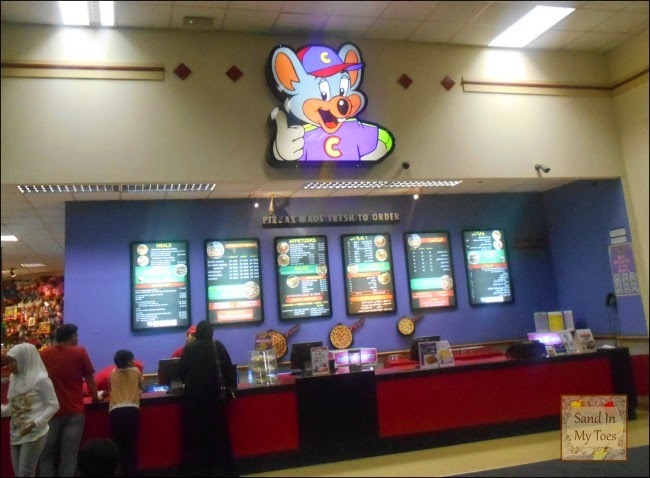 We were invited to visit Chuck E. Cheese's for a review, but all views an opinions are my own.